Sarah and I arrived at the park about an hour before the rides opened and were able to get in line for Behemoth. 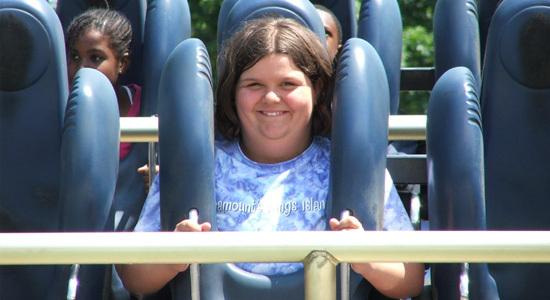 After my ride on Behemoth the day before Sarah was now ready to try it out for herself. Sarah was excited and nervous. Since we had arrived so early we were able to get on the first train of the day. Another great ride. Sarah loved it. As soon as we finished our ride Sarah wanted to go again. So we did. We rode three other coasters bringing our total to 14 of 15 coasters in the park. We spent the rest of the day going back to our favorite rides again and again. The final ride of the day came on Behemoth. It was Sarah's idea to ride in the front seat "no matter how long it takes". For the first time I noticed I could see the CN Tower in downtown Toronto from the top of the lift hill. It was another truly great ride, this time with the full force of the wind in our face. Sarah even put both of her hands up, even if it was just for a second. Our four days of coasters has come to an end. Without a doubt, I truly had a great time with Sarah this week. I'm not looking forward to the nine-hour drive back home tomorrow. Check out all my pictures from Canada's Wonderland.